Jesse James Dupree is a man of the people and a man of Rock. He wears many hats. He’s rocked many faces off. He’s even taken the life of talk show host Tom Green’s desk with a chainsaw live on national television. His journey to become a full-fledged entertainment entrepreneur began when his band Jackyl emerged during the Grunge-crazy early 90’s and carved out – quite literally – a nice chunk of the Rock tree for themselves. And they did it by being real – and real fun. Over the years they’ve maintained a loyal following by being consistent and not buckling to trends or taking themselves or their craft too seriously. There’s zero Rock star arrogance or frontman pretentiousness. They deliver as billed and often leave a wake of happy, hard-working Rock fans floating back to their lives after the curtain comes down. “We’ve maintained our focus and we haven’t veered off, trying to be something we’re not or trying to chase some sound or trend,” Dupree explains. “We’ve found ourselves, especially with the state of the economy, always having been a band that connects with people who bust their knuckles for forty or more hours a week, whether they are 18 or 40 years-old.” And that’s exactly the demo you will see show up to a Jackyl show and leave exhausted. This week Jackyl released their sixth studio album (and tenth release overall), When Moonshine and Dynamite Collide. It rocks exactly the way you’d expect and offers no apologies, nor a tender shoulder to cry on. The long player’s first single, “She’s Not A Drug” is generating a nice buzz out of the gate at stations such as WJJO/Madison, WIIL/Chicago, KQRC/Kansas City, WIYY/Baltimore and WTFK/Cincinnati to name a few. A litany of festivals, bike rallies and charity events are in the offing through the summer, with the band playing its largest annual gig at the monstrous Sturgis Bike Rally in the Black Hills of South Dakota this August. It’s there that the story of one Jesse James Dupree gets a little more interesting. Dupree is looked upon as the unofficial “mayor” of the country’s biggest motorcycle rally and slays crowds young and old with his boot stomping brand of Rock & Roll. Through his relationship with Mike Ballard, owner of the rally’s nexus point, the Full Throttle Saloon, Dupree came up with the concept of a reality show focusing on the Sturgis Rally and the events surrounding the madcap dash to the finish line at the Full Throttle. Each year the world’s largest biker bar is only open during the rally, and the pressure to turn a profit in the weeklong marathon can be as entertaining as it is intense. As Executive Producer of the show, Dupree helped TruTv pull in its highest ratings to date, good enough for a top 5 cable program. No small feat in the avalanche of reality programming available in just about every medium. It was the second straight score for Dupree who previously acted as creator and Executive Producer of the Emmy-nominated MTV series Two-a-Days, and numerous pay-per-view specials including Sturgis Exposed and Mardi Gras Exposed, and the Dirt Poor Comedy Show. started its own record division in partnership with Universal/Fontana. Additionally, JJD is the General Manager for Jude Cole and Kiefer Sutherland’s entertainment company, Ironworks, label home to such acts as Rocco DeLuca and the Burden and Billy Boy On Poison. He also, consults New West Records, home to artists like Dwight Yoakum and Kris Kristofferson, as well as the Austin City Limits live music series. Throughout his career, Jesse has made many friends and connected a lot of dots that have turned into win-win situations for both himself and his business partners in some very outside-of-the-box ways. “There’s so much of what we do that’s not on that radar; events that we created equity in that are annual events, partnering with radio stations and stuff. “We’ve been able to find a lot of cool, creative ways where we’ve managed to leave a stain. We’ve done it in ways such as heading out and doing 100 shows in 50 days. We set a Guinness Book World Record for doing 100 shows in 50 days, and every single one of them was tied in with stations across the country. You’d be hard pressed to find a station out there that doesn’t have a 100 shows in 50 days story. One such story saw WAPL/Appleton’s (now WJJO/Madison PD) Randy Hawke bringing the band in for one of the 100 shows in 50 days, right outside the Green Bay Packers stadium. “When the game let out,” Dupree remembers, “Jackyl was on a tractor trailer rig and we pulled the tarp back and had our PA system up, and had like 50,000 people in front of us.” Jackyl ended their marathon trek in Tampa doing a show for WXTB. His involvement with the massive Sturgis event and the TruTV reality show (recently greenlit for a second season), remains a huge priority and draws millions of eyes and ears. His partnership with radio at the event has grown substantially over the last ten years. After a costly initial investment to run ISDN lines out to the remote Black Hills of South Dakota, more and more Rock stations have set up shop at the Full Throttle Saloon in Sturgis broadcasting live back to their listeners. “They literally had to channel those ISDN lines around Mt. Rushmore, through Crazy Horse, through the Badlands, underneath the casinos of Dead Wood out to Devil’s Tower where they filmed Close Encounters Of The Third Kind, then back into Sturgis,” Dupree recalls. Today stations such as WJJO, WTUE/Dayton, KQRC/K.C., KBER/Salt Lake City, 93X/Minneapolis, KUFO/Portland and many more make up the radio row, reporting back on the rally’s activities and many concert performances with artist and celebrity interviews. Sturgis itself has become a huge concert destination, with performances this year (the 70th anniversary of the rally) from artists such as Disturbed, ZZ Top, Godsmack, Stone Temple Pilots, Creed, Three Doors Down,Skillet, Jackyl and many more. 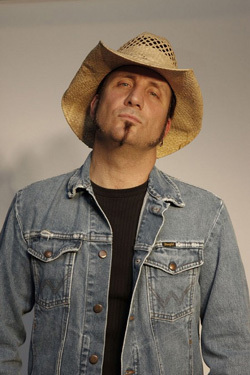 Dupree has his hands in many endeavors, whether it be Jackyl albums, collaborations with AC/DC’s Brian Johnson, Sturgis, his television shows, touring, label duties with Ironworks or releasing records from Powerman 5000 through his own Mighty Loud imprint, lord knows he keeps the plates spinning. This entry was posted on Friday, May 7th, 2010 at 8:37 pm and is filed under Uncategorized. You can follow any responses to this entry through the RSS 2.0 feed. Both comments and pings are currently closed.